Embellished with highly elegant and innovative features, QuickBooks offers a great range of services that help you manage your money in a better way. If you think that merging vendors or suppliers would make your task easier, you can do so without any doubt. Not only can you merge the suppliers or vendors, but you can merge accounts and customers as well. However, if you have never used the merging features of QuickBooks, you may not be familiar with how to do it. But there is no need to lose the peace of mind. You can do it without undergoing any hassles. Launch QuickBooks and login to it by entering the required details. Find ‘Expenses’. You will see this on the left menu. 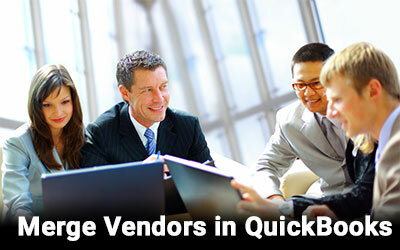 Ensure that the vendors you are going to merge are of the same level or sub-level. If not, edit and bring them both at the same level. Select the vendor whose name you do not want to use or see. On doing so, the name you choose not to use would disappear. Now, copy the information of the one you do not want to use the name to the one that you want to use or keep. Now change the vendor’s Title, First Name, Middle Name, Last Name, and suffix etc. It should be same with the one you are merging it with. Also see to it that the ‘Display Name’ is same. Press ‘Save’ and click ‘Yes’ to confirm. This will complete the merging process and you will not be able to see both the vendors in one single line. In fact, in the process of merging, you delete one vendor and assign its data to the other. However, you should remember that this process is one way and not reversible. You merge the vendors on the permanent basis and you cannot undo later even if you want to do so. The process of merging the vendors, as you saw above, is not at all a difficult one. However, some of the QuickBooks users may still find it a bit confusing. But that should not be an invincible hindrance if you wish to merge the vendors for your greater convenience. Moreover, the QuickBooks support executives are always round the corner and you can get the required support from them if you face any difficulties while trying to merge the vendors.